A new report takes a look at the U.S. military’s strength across the world, including the Asia-Pacific. Politicians are fond of telling Americans that they have the most powerful military in the history of mankind. However, rarely is it explained how they reached that conclusion. As it turns out, despite the seemingly endless number of government and think tank reports being released all the time, there isn’t a single index measuring America’s military power against the threats it is asked to defend the country from. Or at least, there didn’t used to be. Last week, the Heritage Foundation released the first edition of what will be an annual report on America’s military might. The report, entitled 2015 Index of U.S. Military Strength: Assessing America’s Ability to Provide for the Common Defense, is modeled on Heritage’s widely successful Index of Economic Freedom. The Index assesses the operating environment for the U.S. military in three vital regions: Europe, the Middle East, and Asia. These three regions, the report notes, are the most likely to feature the intersection of America’s vital interests with “actors able to challenge them.” For each of the three regions, the factors of alliances, political stability, U.S. military posture, and infrastructure were rated on a scale with five options: very poor, unfavorable, moderate, favorable, and excellent. In Europe, the Index deems the overall operating environment to be favorable. While U.S. military posture in Europe is rated as moderate, all other factors there are ranked as favorable to the United States. Although Europe is characterized by “generally peaceful conditions,” there “remain latent security concerns.” The main challenges in the region include “unfinished business in the Balkans or on Europe’s periphery in the Southern Caucasus” and more obviously, Russia. Russia’s nuclear missiles, its propaganda, and its activities in the Arctic, Eastern Europe, and Caucasus all remain threats to watch out for. The report rates Russian behavior as “aggressive” and its capability as “gathering,” the second strongest possible level of capability after “formidable.” Another worry for the United States in Europe is the declining capacity of NATO allies, meaning that America will be forced to participate in operations, like Libya, that ought to have been shouldered by allies. In the Middle East, the Index rates the operating environment for U.S. forces as moderate, the rating given to all other factors in the region except political stability, which is deemed unfavorable. The Middle East is described as a “troubled area riven with conflict, ruled by authoritarian regimes, and populated by an increasing number of terrorist and other destabilizing entities.” Due to its location, it is extremely strategically important to the United States. American alliances in the region are bilateral, and while its relationships with countries like Israel, Egypt, Jordan, and Saudi Arabia are strong, there is no NATO-like organization for this region. The military records of the states of the region are “mixed,” with Israel being considered the most capable, followed by the Gulf States, who despite this fact are “quite happy to continue their dependence on the U.S. for their security needs.” The two largest threats to the United States from this region are Iran and greater Middle East-based terrorism. Iran, which “represents by far the most significant security challenge to the United States, its allies, and its interests” is classified behaviorally as aggressive, with an “aspirational” capability. Middle East terrorism is likewise ranked as aggressive and aspirational. In Asia as well, the overall operating environment is considered moderate, although the alliances factor is considered favorable to the U.S. Unlike in Europe, bilateral relationships form the mainstay of U.S. partnerships in the region, as there is no NATO-like security structure. Among American allies, “there is a wide range of capabilities, influenced by local threat perceptions, historical factors, and budgetary considerations.” The bottom line is that the Asian strategic environment is “extremely expansive,” so it is difficult to make blanket assessments of it. There will always be physical limitations due to the “tyranny of distance” and the United States cannot always count on the support of its allies due to their varying capabilities and historical tensions with each other (with the prime example being Japan-South Korea tensions). According to the report, the three main threats from Asia are terrorism (from Afghanistan and Pakistan), China, and North Korea. All three threats are ranked behaviorally as being aggressive. China’s capability, like Russia’s, is considered to be “gathering” and Beijing continues to “present the United States with the most comprehensive security challenge in the region.” North Korea and terrorism from the Af-Pak region are considered “capable” threats. The situation in Afghanistan and Pakistan, in particular, is very uncertain. Also threatening regional security are the border disputes involving various Asian claimants, including the South China Sea issue. Of all the countries mentioned as being aggressive towards the United States, the most capable are China and Russia, who present the highest threats to U.S. vital interests. Terrorism from Afghanistan and Pakistan is judged more dangerous than terrorism from the Middle East; Iran and Middle Eastern terrorism’s abilities to threaten U.S. interests are relatively lowly ranked, as aspirational. In terms of the overall status of American military power in dealing with all these global threats, the overall posture of the U.S. military is rated as “marginal.” The index concludes that this means that currently, U.S. military force is “adequate to meeting the demands of a single major regional conflict while also attending to various presence and engagement activities,” thus falling below the Pentagon’s ideal “capacity” needs. There is no doubt that the military is under “significant pressure” and many units are undergoing deployments for longer periods. In terms of overall power, the Index concludes that the power of the army, navy, marine corps, and nuclear forces is marginal, while the U.S. Air Force is strong. This is not surprising, given the heavy reliance on air power in U.S. campaigns. Several aspects of American nuclear power are considered weak, as is the capability of the navy, the capacity of the marine corps, and the readiness of the army. 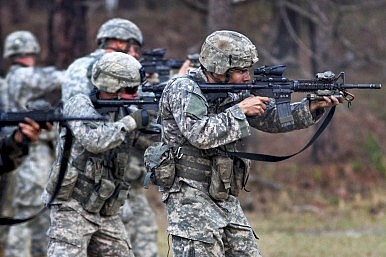 The report concludes that the U.S. military is “marginally able to meet the demands of defending America’s vital national interests.” While America has the capability of securing its objectives, its ability to do so on multiple fronts in increasingly becoming frayed, and it is unlikely that U.S. forces will be able to handle two major conflicts at once, given their present state. The move would help boost U.S. force readiness in the Asia-Pacific region.